The Bolivar Petit Belicosos LE 2009 is a strong and rich Petit Pyramid, 4.9” (125mm) long, of 52 ring gauge, and comes in a 25 cigars box. 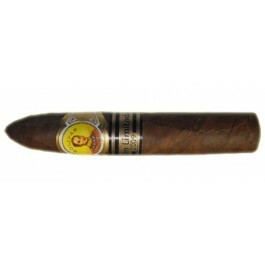 Bolivar Petit Belicosos is one of the three Habanos Limited Edition releases for 2009. The two year aged wrapper, binder and filler make this cigar a full bodied smoke like no other. This is the first time that a Bolivar is represented within the limited edition collection. Bolivar is well recognized for it's rich and intense flavors, making it very desirable among cigar connoisseurs all over the world. With an intense taste with very light over-sweet touches with slightly hot notes having a very greasy end in the mouth, Bolivar Belicosos Finos are considered as an excellent shot with very good and homogeneous combustion. Other features for Bolivar Belicosos Finos are: scent sensitive at coldness and appears in hit starting from the second third.